The MPS-2 measures a wide range of soil water potentials (-10 to -500 kPa (pF 2.01 to pF 3.71)) without requiring user maintenance and factory calibration. Unlike tensiometers, which require a trained operator, this dielectric water potential sensor requires no care or feeding. Instead, it can simply be put into a hole, jacked in to a data logger, and left to log water potential data. While the MPS-2 doesn’t have the precision of UMS tensiometers, its larger range makes this sensor suitable for measuring the water potential in organic systems or other drier systems where cavitation of tensiometers is a concern. The added temperature measurements can be used to estimate soil water potential in partially frozen soils. Get the data immediately with the Em50 series of data loggers. Just install the sensor, plug it into the Em50, set the clock and measurement intervals, and start logging data. No programming needed. The MPS-2 can be integrated with systems manufactured by other companies (such as Campbell Scientific) using serial or SDI-12 communication modes. Some programming will be needed; however sample programs are accessible. The MPS-2 has much higher precision with the factory calibration (±25% of reading from -10 kPa to -100 kPa*) than other matrix sensors available on the market. User calibration is more tasking, however it can significantly increase precision. 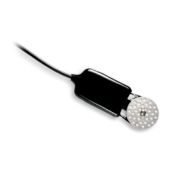 Aside from the tensiometer, the MPS-2 is the sole calibrated water potential sensor on the market. Deficit irrigation monitoring and control. Water potential monitoring in the vadose zone.